Congratulations to our member of the month, Laura Hill!!! 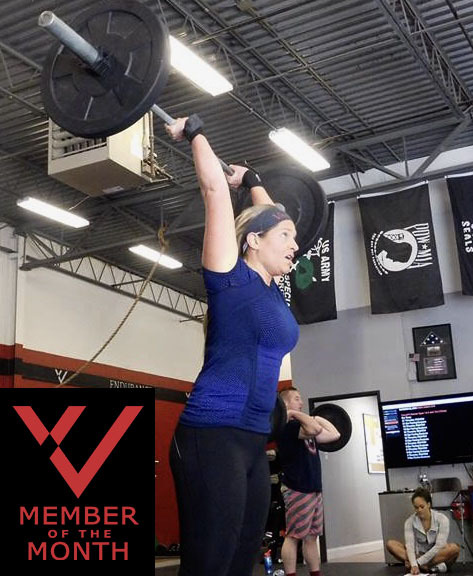 Laura was a long-time CrossFitter before joining us here at CrossFit Vae Victis, but has also made huge progress over the last year. A steadfast member of our noon class, she shows up each day ready to work no matter what task is presented, you’ll find no cherry picking there. She’s always good for a laugh and to help lighten the mood leading up to the tough metcon ahead. She’s encouraging to every member in class and has a way of pushing them to be their best. Laura is very fond of her barbell movements but has been diligently crushing her weaknesses piece by piece. She shows up 5-6 days a week and can be found each day before and/or after class chipping away at gymnastics skill work, mid-line work and our buy-outs. It hasn’t gone without notice and the progress can be seen in all of her movement. Aside from walking the walk inside the gym, she is also probably the most diligent athlete I have seen with her sleep and nutrition. She set goals, a plan for her nutrition and has stuck with it for the long term. We’re proud to see all the progress that has been made through all of her hard work! Below are a few fun facts about Laura that you may not know. I started CrossFit in the Fall of 2012 when I saw a video of my good friend’s 60 year old mom doing RX pull-ups. I was so proud of her and very intrigued, since I was never able to do pull-ups in the gym. I trained at CrossFit Inspire in Malvern, PA until I moved to New Jersey and found Vae Victis. I enjoy the friendly competition, but my favorite aspect is that it forces you to become comfortable with being uncomfortable. I love the coaches, members and of course Pat’s programming! My old gym was very big and it was easy to feel lost and looked over by coaches. Everyone at VV is very supportive and really enjoys working out together. I’ve been to over 200 concerts in the last 15+ years. Once again, congratulations go out to Laura for impressing all of us with her amazing attitude and perseverance. That is what it means to be the CrossFit Vae Victis Member of the Month. Check back next month for the next Member of the Month. We will once again be highlighting one of our great members that is killing it in the box.